Shred the potatoes by hand or in a food processor with the shredded blade. The latter takes about 2 seconds to complete the task, so if you want to make short work of things, put that box grater away for another day. You can keep the skins on the potatoes, to make even shorter work of it all. Combine the shredded potatoes with the eggs and panko crumbs. Season to taste with salt and pepper. Once you’ve combined all of the ingredients, you need to blend them just a little more. Back to the food processor, this time fitted with the steel blade. Use a couple of quick on/off pulses to get it all blended and chopped up just a bit more. This blending will make the mix easy to shape. Shape the mix with your hands into bite-sized “tots”. Place them side by side on a parchment paper covered baking sheet. Bake in a preheated 425 degree oven for about 15 minutes or until golden brown. 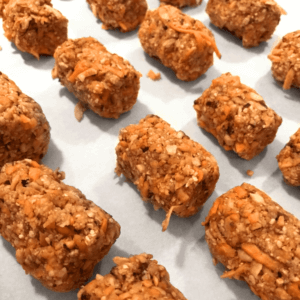 Once the baked tots are cooled, they freeze beautifully. Freeze them in a single layer on a baking sheet. Once they are completely frozen, transfer to a plastic freezer bag. To reheat, place frozen tots on a baking sheet at 325 for about 30 minutes.